Kirkwells’ Neighbourhood Planning News Winter 2013/14 Issues Out Now! 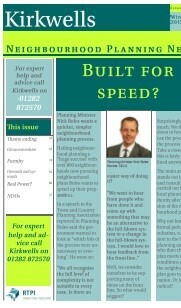 The Winter 2013/14 issue of Kirkwells’ popular Neighbourhood Planning News is out now. To get your copy email Michael. Make sure you do not miss a future issue – subscribe. Need support to produce your neighbourhood plan? Get expert help. Just call 01282 872570. Not sure what neighbourhood planning could mean for your area? Book one of our FREE training sessions.